Offering the best energy-efficient performance, Pilkington Spacia™ is a vacuum insulated glass product that has the thickness of a single pane of glass, yet unrivalled thermal insulation similar to that of double glazing. 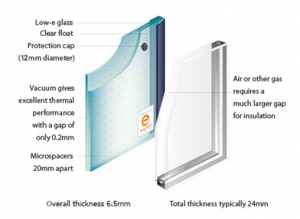 Consisting of an outer pane of energy-efficient glass and an inner pane of clear float, the two panes are separated by a vacuum cavity of just 0.2mm, providing outstanding thermal performance. The overall thickness in its entirety comes to 6.5mm, giving it a much slimmer profile than a standard unit. The versatility and innovative nature of this product is perfect for restoration projects, blending almost seamlessly into original frames. The vacuum glazing system enables period properties to maintain their original design and charm too. The Victorian Terrace at the Building Research Establishment (BRE), a construction research consultancy, has been transformed into three energy-efficient terraced homes thanks to Pilkington Spacia™. Formerly featuring single glazed sash windows, notorious for allowing heat to escape, the building suffered with draughts and the glass did not fit snugly. 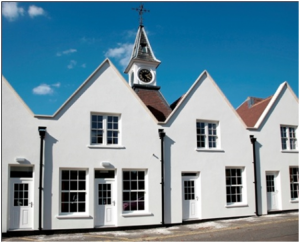 Offering similar thermal insulation to double glazing and a better acoustic performance than triple glazing, BRE found the performance and look of Pilkington Spacia™ to be an advanced glazing solution, perfectly suited to period properties. For all the latest news at Pilkington UK including project references and new products, please click here.